I have been trying to figure out how to write this post for a few weeks now. I have ventured into new territory (again) and this time it seems a bit scary to share. I have started painting. With real paints and brushes. And it is going ok! I love paintings. I collect paintings. Good ones. I have much envy of people who can wield a paintbrush and make the colours look like something. But I can’t paint!! Or so I thought. Yeah, I know, not exactly a work of art. But I had FUN!! (fun=good) Enough fun that I thought I should buy some real paints and see where it led. I googled painting tips and tutorials and found an incredible resource in Will Kemp: http://willkempartschool.com He’s funny, very talented and a great teacher with lots of free and paid video and written tutorials on his site. He manages to share his considerable artistic and technical expertise in a very approachable and non-intimidating way. I eagerly read and watched as much as I could and purchased some paints (acrylics) based on his recommendations. If you have an interest in painting I really recommend his site. I was trying to figure out how to display them and got the idea to mount them on little wooden blocks as shown below. They have a hole in the back for hanging, but are about 1.5″ thick, so they can stand up too. I print them on paper and then mount and seal them. The third photo shows the fox mounted on a wooden panel, about 8 x 10 x 1″. At this point I was pretty happy with my progress so far. Of course the self-criticism was there, which is important because that’s how I decide where I need to improve, but that little critical voice wasn’t so harsh that it hurt too much! So….I mentioned I had struggled with writing this post. There are a few reasons. One is that it feels scary to share these paintings. I am happy with my painting progress, but it is so different than posting photos of pottery. I am comfortable with my pottery. I know it and I’ve been doing it for a long time! If people don’t like it, that’s ok, because others do. When people criticise my pottery I do admit to feeling emotional, but after a bit I can digest the comments, learn from the ones I feel have merit and disregard the others (eventually!). Right now I am so new at painting and these paintings are just all mine, in my little house, only shared with a few friends and family who have always supported me. However, if painting is to become part of my world, I guess I need to start posting them and get over that feeling!! I am actually proud of my paintings and how I’m doing after just a short time. I suppose I have been doing visual arts for a long time, so while painting is new, I have experiences in other mediums that have helped me. That being said, I haven’t shared the landscape painting I tried which went horribly and terribly wrong….so far I am sticking to animals, they’re what I’ve always been attracted to making in clay, so it seems natural that I paint them. I’m enjoying just focusing on the animals, like the paintings are portraits, with the emphasis on the animal, not their surroundings. Sometimes I tone the canvas with a colour that peeks through as I paint, sometimes I just start right onto the white. I have a friend who is also painting and we’ve been sending some photos of our work back and forth and making suggestions and sharing techniques that we’ve read about which has been really helpful to me and a lot of fun. Colour: Trying to match the colours in the scanned and printed image to the original painting. This involves working with colour profiles in my computer and some fiddling in photoshop. I am still working on this, but so far I am pleased with the printed results. Paper Type: I’ve chosen a matte, acid-free, 100 lb heavy stock that comes in 12×18″ sheets. It is bright white and gives gorgeous results with my printer. And so on, and so on!! Ok, this post is getting very long and I’ve still got more to say. One of my self-criticisms was that my brush strokes were too small and picky. I would start out by blocking some colours in with big strokes and larger brushes and suddenly I’d be poking the paint on with tiny, tiny little chicken scratches. So I decided to paint some bigger paintings on canvas. So far my biggest is 12×16. I want to go bigger though….I want to paint HUGE ones! I still am fighting the urge to use the smaller brushes, they just seem to jump into my hand. Below is what happened when I printed it and was trying to put it in a mat and frame. I printed it too large for the mat, and was holding it up behind the mat to see how much smaller I should go and I thought, “too bad you can’t see his nose”. So I fixed that by cutting around his nose and popping it over. 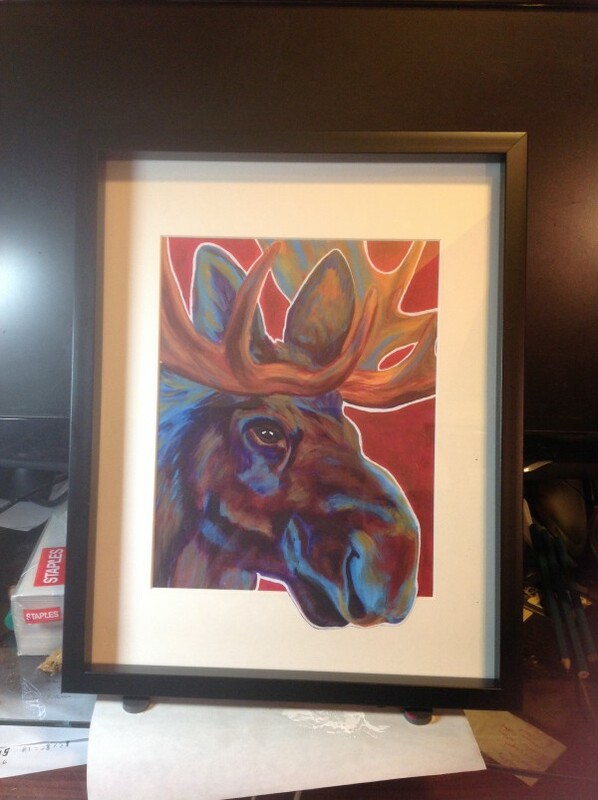 I will offer these as prints both ways, just a straight print of the moose, and then this one where it looks like he’s looking in the window. I love this way, it makes me laugh. I still have more paintings to share, but I will save those for another post. I’m heading off to walk on the Camino (from Moissac in France to Pamplona in Spain, over the Pyrenees with my mum) in less than a week and I still have to get my taxes done before I go! I’ll be gone for the whole month of April. My glorious, explorative, creative painting time is coming to an end…when I return I must dive head-first into the pottery studio! Hopefully I’ll be able to take painting breaks once in a while, but there are a lot of puffins still to be made between now and June. March 25, 2015 in Raku Pottery. Wow! You are super talented!!!! 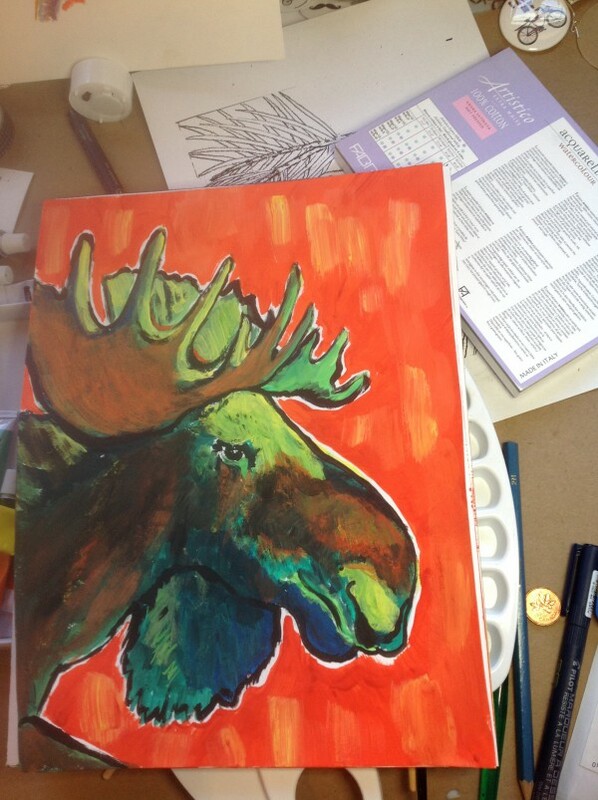 If that moose Is for sale..I love it!